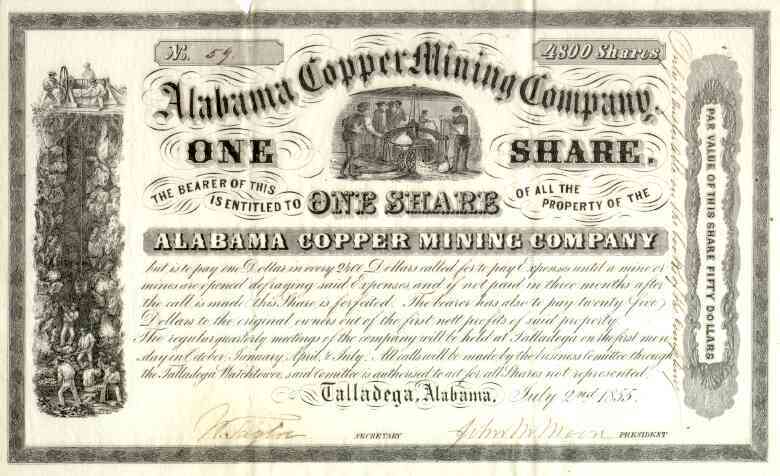 1855 Alabama Copper Mining Stock Certificate. Very attractive and scarce Alabama copper mining scripophily certificate with center vignette of copper smelting and side vignette of vertical shaft with windless lowering bucket to miners at bottom of shaft. Interesting certificate. This is a bearer stock: "Only transferable on the books of the company." hand written on right side of certificate. Further, owner was subject to assessments specified on certificate. If not paid, ownership is forfeited. Whether investors made money on this mine is unclear. VF condition with minor edge damage at top border.